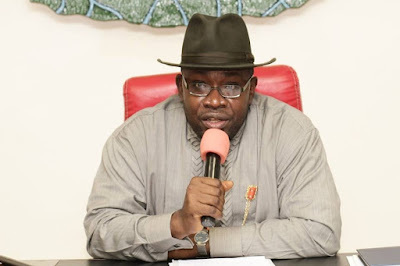 Yenagoa—Bayelsa State Deputy Governor, Rear Admiral John Jonah (retd), on Wednesday, described as “untrue,” claims that the recent setting up of the Establishment Committee by the state government to ascertain the true number of civil servants on its payroll was targeted at sacking workers over partisan politics and retrenchment in the civil service. He said though the decision of some workers in the state civil service to openly campaign for political parties of their choice was wrong and against the civil service rule, the current administration under Governor Seriake Dickson did not give any directive on sanctions or embargo on salaries of such workers. The deputy governor, while briefing newsmen in Yenagoa on the government’s monthly spending for the month of November 2015, said that the ongoing verification exercise being conducted by a committee on Establishment and the delay in payment of salary was due to the continued deficit being experienced by the state government. He said: “On the issue raised by about 500 workers in the state, to the best of my knowledge and due discussion with the governor, there is no plan by the government to retrench any worker in the state. We are doing this due to the consistent deficit we are experiencing. That is why there is no government officials in the committee. On the state finances, the deputy governor announced a deficit of N1.713billion spending in the month of November, 2015 with a total of N4.804billion recorded as money that accrued to the state and over N6.518billion recorded on salary payment for state workers and political appointees, overhead costs and loans repayments.